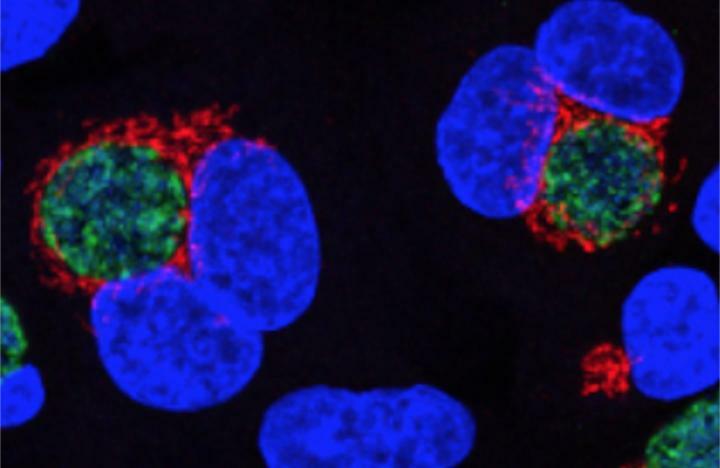 Scientists at the MRC Laboratory of Molecular Biology in the U.K., and Duke University in the U.S., report new insights into the mechanisms by which the pathogenic bacterium Chlamydia trachomatis hijacks the human host cells in which it replicates. Their finding, which they say “unveils a remarkable case of protein moonlighting,” suggests that one Chlamydia protein, known as ChlaDUB1, manipulates human cells in two different ways, and could offer up a new therapeutic candidate for the pathogen, which causes one of the world’s most common sexually transmitted infections (STIs). Many pathogenic bacteria produce effector proteins that disrupt host signaling during an infection. However, how these effectors work, and their roles within host cells are not well understood, the authors noted. This is particularly true for Chlamydia trachomatis, which is a World Health Organization designated neglected disease pathogen. Chlamydia is unlike other bacteria, in that it can only survive inside human cells, explained Robert Bastidas, Ph.D., a research assistant professor within the laboratory of Raphael Valdivia, Ph.D., vice dean for basic science at Duke University. The organism enters and hijacks host cells, breaking up the host cell’s own protein-modifying Golgi apparatus and maneuvering the pieces around itself like a shell. The reasons for this aren’t clear, although the bacterium may use the component sugars and fats to fuel its own growth, Dr. Bastidas suggested. The new research, led by structural biologists David Komander Ph.D., and Jonathan Pruneda at the MRC Laboratory of Molecular Biology, together with Dr. Valdivia, homed in on the Chlamydia effector protein ChlaDUB1, which is one of the proteins used by the bacterium to disrupt host cell function. ChlaDUB1 is a deubiquitinase effector protein that removes the ubiquitin molecules that cells attach to other proteins to either activate them or target them for destruction. Human cells use ubiquitin to signal inflammatory responses, for example in response to pathogens such as Chlamydia. The researchers’ studies found that as well as its function as a deubiquitination enzyme, ChlaDUB1 also has a second activity in cells, which is to modify proteins by acetylation. This disrupts how cells signal that they need to fight an infection. And while deubiquitination is a hydrolysis reaction and acetylation is a condensation reaction, the team’s studies indicated that the ChlaDUB1 enzyme can apparently toggle between both functions. Dr. Bastidas suggested that Chlamydia may have pared down its genome to help it survive in its host cells, a process that resulted in the production of the space-saving protein, which is the only one identified in the organism that has these dual functions. “Instead of making two proteins, one that has the deubiquitinase activity and a separate one that has acetylation activity, they’ve combined that into the same protein,” he said. To further investigate the function of the Chlamydia ChlaDUB1 enzyme during infection, the researchers set up infection experiments using both wildtype Chlamydia and Chlamydia that were engineered to carry a mutant ChlaDUB1 enzyme. The results showed that wildtype bacteria could chop up the Golgi apparatus in their host cells, but the mutant Chlamydia couldn’t. The team aims to look for drugs that can disrupt ChlaDUB1 function. Such drugs could feasibly inhibit the ability of Chlamydia to block the body’s immune system attack on the organism, and so reduce or even remove the requirement to use traditional antibiotic therapy. “If we develop these inhibitors and they’re specific enough, then we won’t have to use antibiotics,” Dr. Bastidas stated.